So, things happened yesterday. A few of them good, some of them meh, and most of them bad. For Michigan, it was yet another in a long line of games everyone would just rather forget. Brady Hoke knows what's coming. You can just tell. Nothing will happen before the Ohio State game, but its over. 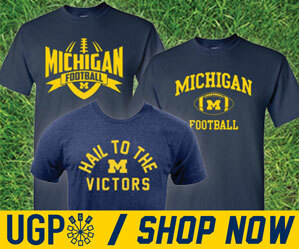 This is the end for Hoke at Michigan. When Maryland's CJ Brown scored the go ahead touchdown with 5:59 to go in the game and highly-touted Michigan recruit Mike Weber announced via Twitter that he was no longer committed to the University of Michigan...well, that may have been the lowest 30 second stretch in an already miserable 2014 season. We've been waiting almost 3 whole years for Dennis Norfleet to return a kick/punt for a touchdown after almost breaking loose numerous times. So it stands to reason the one and only time he takes one to the house...which probably would've put game away and slammed the door on any Maryland comeback...was called back for a highly questionable block in the back call. Michigan, unsurprisingly, never recovered. The ensuing drive stalled once the ball crossed the 50, as usual, and two unsuccessful Devin Gardner roll outs on 3rd and 4th down ended any push Michigan had left offensively. That punt return flag shifted all the momentum to Maryland. The roughing the kicker penalty on Maryland's 4th quarter field goal that turned into a touchdown one play later finally killed the Wolverines. For Devin Gardner, it was a fitting end. He finally looked like he had his legs back for the first time since the start of the season, but his passes were hit and miss. But drops from guys like Devin Funchess (color me shocked) did him no favors. But at least Gardner scored on a scramble, and that made me happy, if only for a moment. He played hard, along with many other Wolverines, and that shouldn't go unnoticed. But yet again, Michigan's mistakes did them in. This time, it likely cost them a bowl bid. But as we sit here staring down the barrel of a top rated Ohio State team...does it really matter? A bowl is just another chance for Michigan to embarrass itself, and only delays the inevitable. How important are 15 extra practices for a lame duck coach and a team that is already broken? A loss next week turns the page sooner for Michigan and maybe that's how we need to look at it. The sooner they can get to rebuilding the program from the top down, the better it will be in the long run, for whoever the next coach will be.